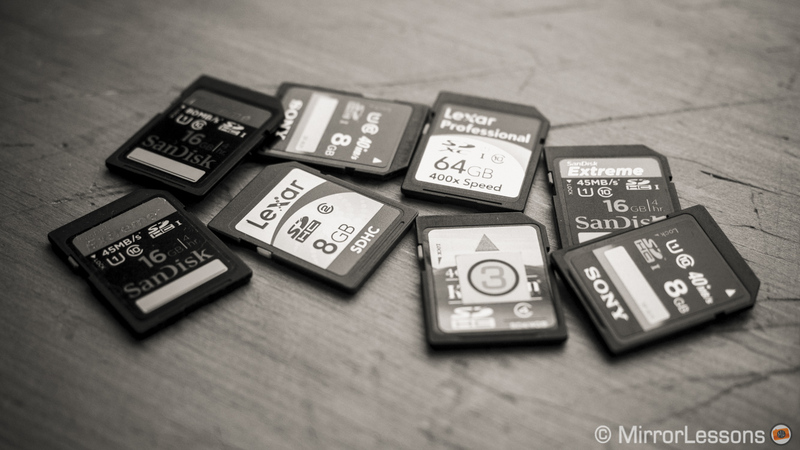 Planning to buy a memory card for your mirrorless camera? Ask yourself these 4 questions first! You are here: Home / Accessory Reviews / Planning to buy a memory card for your mirrorless camera? Ask yourself these 4 questions first! One memory card is as good as another, you say? Though on the outside they may look nearly identical, the performance and capacity of your memory card can vary, just as a $2000 MacBook can run circles around a $200 notebook computer. Memory cards are built with different capacities for the same reason cameras are built for different purposes–for the simple reason that photographers have varying needs. A sports or wildlife photographer, for instance, will certainly need a memory card that is both fast and capacious for rapid shooting sequences, whereas a landscape or street photographer may care less about these aspects. And let’s not forget that in recent years there is also video recording involved. 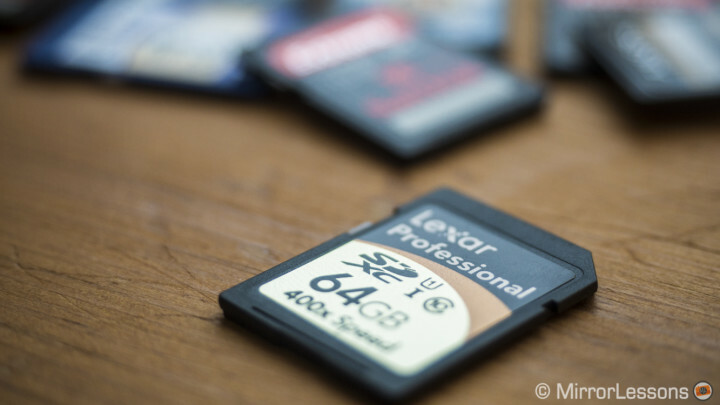 Before you buy a memory card for your mirrorless camera, it is important that you carefully consider the following four points–compatibility, brand, speed and space. Doing so will most likely save you money, as you will choose a memory card that actually suits your needs, and will help you get the most out of your shooting experience. Are the memory card and camera compatible? SD (128MB to 2GB). The first generation SD card. They have been discontinued but if you find some around your house, they will work on all SD, SDHC, or SDXC devices. Note that they might not be compatible with the video recording capabilities of today’s cameras. SDHC (4GB to 32GB). Most cameras built after 2007 should be compatible with SDHC. It is not backwards compatible with cameras that only accept SD. SDXC (64GB to 2TB). Most cameras built after 2010 should be compatible with SDXC. It is not backwards compatible with cameras that only accept SD or SDHC. UHS-I and UHS-II (Ultra High Speed). Enhancements of original SDHC or SDXC interface with improved write and transfer speeds. There are no backwards compatibility issues. All mirrorless cameras will accept either standard SDHC or SDXC memory cards. The difference between these two standards is that SDXC has a higher storage capacity and most of the cards have a faster writing speed. Either card type may have an Ultra High Speed bus that basically enhances the writing/transfer performance of your SDHC/SDXC card. While a UHS-I card will work on non-UHS-I cameras, you will only notice the benefits if your camera is compatible with the Ultra High Speed bus. Almost all recent cameras are UHS-I compatible but at the time of writing, the only camera that is compatible with the brand new UHS-II format is the Fujifilm X-T1, but this will surely change in the near future. If in doubt, find out which memory cards are compatible with your mirrorless camera by simply referring to the manual or looking up the camera specifications online. Is it a well-known brand? We’ve heard one too many a horror story about photographers shooting entire sessions with an SD memory card made by an unknown third-party, only to discover later on that some information went missing, or that the images weren’t there at all! Of course bad luck can strike even with brand name card, but it is far less likely. To avoid the embarrassment of telling your client that your images have mysteriously disappeared, play it safe and always go with a respected brand name–the difference in cost between one brand and another is minimal anyhow if you consider the long term benefits. Transcend cards are cheaper than Sandisk and Lexar but so far we’ve never had a single issue with any of these cards and Mathieu has used them a lot for video recording. For our mirrorless cameras we have lots of 16GB Sandisk Extreme Class 10 45mb/s, and these are the cards we use for all the photos you see on our website. They are fast enough even for continuous shooting and are not expensive. Just ten years ago, people would have found it hard to believe that one would need any more than 2GB of space on a memory card. Fast forward to 2014, and we now have memory cards that can contain up to 2TB of information. That said, the average photographer will rarely need anything more than 32GB of space, and often, even cards with only 8 or 16GB will suffice. The amount of space you want from your card will depend very much on how much you shoot, how you shoot, and whether you plan to carry extra memory cards with you. In our case, for example, we tend to focus on street, landscape and macro photography where burst shooting is rare. Not only, but we always carry around a memory card case with 4-5 extra cards should the one we are using fill up or malfunction. This means that 16GB is more than enough for our needs. If you are a sports or wildlife shooter, on the other hand, you may find your card filling up quite quickly, especially if you shoot in raw-JPG format in burst mode. In this case, you’d certainly feel more comfortable with a memory card that has at least 64GB of space. Moreover, some RAW files take up more space than others. For example Fuji RAW files are among the biggest (more than 30MB). When working, Mathieu tends to use more cards with less space instead of one or two cards with abundant space. The reasoning is that if he loses one card, he will lose fewer photos than if the card were smaller. Of course this is just one way of working–other people might prefer to carry around fewer cards. In the end you have to work with what makes you comfortable. Standard SDHC/SDXC memory cards can be divided into four different Speed Class standards: 2, 4, 6 and 10. These numbers correspond to the minimum rate at which the writing of data can be sustained, with 2 (2MB/sec) being the slowest and 10 (10MB/sec) being the fastest. However, it is completely possible for a well-made memory card to outperform its category–for instance, a Class 2 memory card could potentially achieve a write speed of 4 or 8MB per second. Even though this is possible, you should always buy a memory card that meets or outdoes the requirements of your host device (camera), meaning that if your camera requires Speed Class 4 SD memory card, you should use a card with a Speed Class standard of 4, 6 or 10. USH-I and II memory cards, on the other hand, have a Speed Class of either 1 or 3. Class 1 denotes a minimum write speed of 10MB per second whereas Class 3 starts from an amazing 30MB per second. Class 3 is also capable of recording 4K video. These values are only valid on cameras that are USH-I or USH-II compatible. 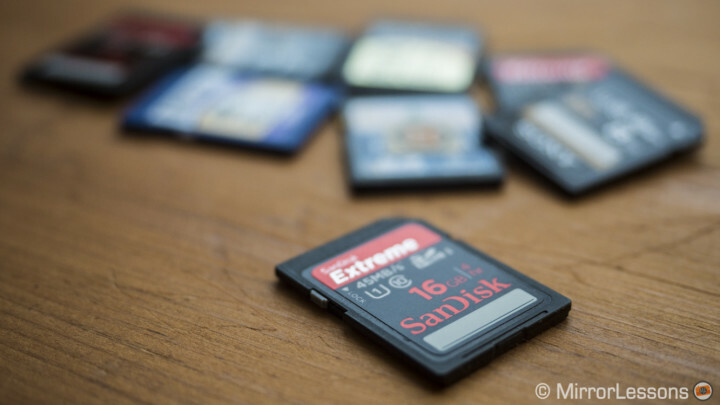 Cheaper SD cards from less well-known brands can be less robust than others but I’ve always found that SD cards in general are not the best when it comes to robustness. For example more than once the write-protect switch has broken on our cards, leaving them write-protected without the possibility to enable them again. A good tip could be to put it in your card holder the other way around so that you know that the data contained in the cards needs to be backed up before using it again, instead of protecting the card by using the switch. The general rule is to handle them with care especially when inserting them into the card slot on your camera, and always keep them safe in an SD card holder. We personally haven’t had any real problems so far but they are certainly less solid than compact flash cards or larger memory supports. Here are three of the most spacious and affordable memory cards on Amazon. You can find memory cards with even more space than this but they are on the pricey side and aren’t necessary for the average photographer. If you don’t need lots of space or a very fast writing speed, here are three SD cards that are cheap and reliable. These will suit you fine even for Full HD shooting with AVCHD codes that are around 28 mb/s of data. Here are three memory cards which place priority on speed. They are all SDXC format with Speed Class 10 and UHS-I. They will also suit HD or 4k video with a high data rate (100mb/s or more) very well.